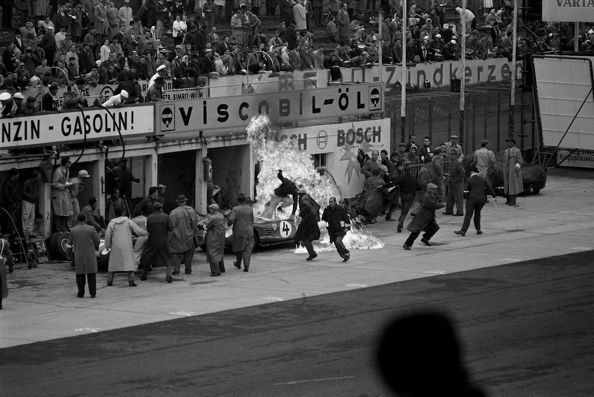 Giorgio Scarlatti’s Ferrari Dino 246 S catches on fire in the pit lane. 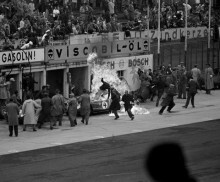 A young Mark Leonard, was standing next to his father Max across the pits when the incident happened, Dad immediately turned his 8mm camera towards the action unfolding right in front of his eyes. What you can see below is never before seen amateur footage. “A Day at the races with dad, every summer, we used to frequent the Nurburgring 1000kms and many other races.” says now 59 year old Mark Leonard, who takes his son Max to the race tracks as often as possible. More footage from the 1960 Nurburgring will be posted soon, so make sure to follow us on Facebook, Twitter, and subscribe to our Youtube and Vimeo channels.